Today’s Food Memory comes to you courtesy of moi. This is my story and I’m sticking to it. 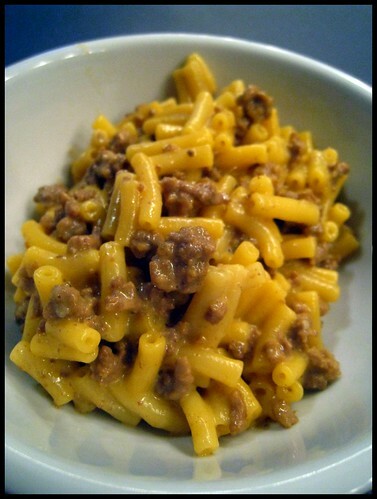 There is one dish that sums up all that was good for me as a kid – Frizzled Beef and Macaroni. Its cheesy, beefy, creamy goodness is a favorite, not for any particular moment it recalls, but because it recalls so many. Digging into a steaming bowl of Frizzled Beef and Mac is like looking through a kaleidoscope. The far edges are a little blurred but the center is clear and bright. Each bite turns the end of the kaleidoscope, changing the pattern. One moment, I see my grandmother at the stove with her cast iron skillet. The next, I’m in the backyard learning to ride a bike without training wheels. Or I’m in the dining room practicing to become a famous Opera singer. I see old lady glasses and braided ponytails. Hot summer days running through the sprinkler replay in my mind. As do muggy nights of baton twirling and catching lightning bugs. Hogan’s Heroes and Fantasy Island are on the television at night. Captain Chesapeake, Mondy the Seamonster, Lancelot Chimp, and Speed Racer great me on the screen after school. I recall sitting on the front porch in the dark when a thunderstorm would knock out the power. And bundling up to go out at midnight on New Year’s Eve and make some noise. I dig through the cedar chest and buffet drawers looking for hidden treasures and I pet the leopard spotted coat and fur stole in the closet. I feel fingers pruned and wrinkly from long afternoons spent in my best friend’s pool. I smell Tinkerbell powder and Love’s Baby Soft. I go to SkateLand on Sunday and circle the rink in my pristine white leather roller skates with baby blue pompoms. I Etch-A-Sketch and Spirograph. I Mad Lib and play Barbies. Swimming lesson, May Festivals, and sips of Pabst Blue Ribbon all come into sharp focus. I read letters from Santa on Christmas morning and watch Saturday morning cartoons. I catch the Orioles magic and for once it snows enough to close Baltimore City Schools. I’d like to thank my Grandmother for her Frizzled Beef and Macaroni. I had no idea at the time that it would come to mean so much. I just thought it tasted good. BAH Note: There’s no easy way to say this, except to just say it. This recipe starts with a box of Kraft Macaroni and Cheese. And it uses real butter, whole milk, and sliced American Cheese. Yes, you could use low fat this or skim that. But I beg you, please don’t. Because Frizzled Beef and Macaroni, as The Mistah said when he tried it for the first time, is simple and unassuming. And good. Enjoy hon. Heat a large skillet over medium heat and slowly cook the ground beef, breaking it up into small pieces (frizzles), until it is browned and just cooked through. Transfer the ground beef to a mesh strainer. While the ground beef cooks, combine 3/4 cups of milk and butter in a saucepan over medium heat. Once the butter has melted, stir in the cheese sauce powder and whisk to combine. Gradually add two slices of American cheese, allowing them to melt completely. Taste the sauce and add additional milk and cheese to taste. The sauce should not be thick. Keep the sauce warm over low heat while you cook the macaroni. Add pasta to the boiling water and cook for approximately 8 minutes, until done. Drain pasta in a colander and return to the empty pot. Add frizzled beef and cheese sauce to pasta and stir to combine. Taste for seasoning, you may need a very small pinch of kosher salt. Leftovers can be reheated on low power in the microwave. Add a tablespoon or so of milk to smooth out the sauce when reheating. Tracy, this is hands down my favorite meal from growing up. Besides tasting wickedly good (in that bad for you way) it makes me feel quite contented. I sure don’t remember that commercial. And I’m sure my grandparents never saw it otherwise they’d never have bought me the stuff! Oh macaroni and beef…it was a staple of my childhood too 🙂 that and spam! Me no likey SPAM. It was always pan fried and served with canned white hominy. In fact, that’s one of my least favorite food memories. Followed closely by liver and onions. I feel the same way when I dig into our family staples: pork chops and peas, tuna casserole, salmon patties and macNcheese, and meatloaf with mashed taters. I automatically feel like I’m 7 when I bit into them. Brooke, isn’t it amazing how food can transport us? Any chance that I can get you to send me one of your family favs for the project? Because everything that you mentioned sounds delish. The spouse would refer to this as hamburger helper…..and he would have cold shoulder for dinner! Emily, this is totally hamburger helperesque and it’s such a modest dish that it doesn’t mind being referred to that way. This is definitely not good for you food. Before I made it for BAH, I hadn’t had it in many, many years. Somehow spam always paired up with applesauce at our house and some green burnt offering unrecognizable even in retrospect. I do like it fried crispy and on toast with yellow mustard tho. Wendi, Ihave an idea sort of about the heirloom recipes. You said your dad said that your cucumber soup was as good as his grandmother’s. How about you pick his brain for the story that he recalls when he sees cucumber dill soup? and I will bet you my last Balkan dollar that he can relate to the crepes and sour crean with dill fronds on top to go with. My Latvian friend says there is some kind of bread thing with bacon ( what else?) I bet his grandmother had a recipe for something like that too. that way you will have recipes from both sides of your family and bragging rights to both. Vitay also says there should be some kind of stuffed cabbage in a tomato sauce with sour cream and something sauerkrauty. There is always the home brew made with raisins. Just chain the bottle to something strong. This stuff walks. He gave me some and I am still trying to recover YIKES! From what I do know, the great grandmothers were more potato pancake ladies than crepes ladies. But so much of all that was lost because my other grandmother was definitely not a cook. I think I inherited some of that gene from her which I work everyday to overcome. Stuffed cabbage rolls were a staple but they never involved kraut or sour cream. I managed to get some intel about that out of Grandma and need to give it a try. The homebrew we unearthed after great grandpa died was cherry something with twigs. And yes, it knocked your socks off. God only knows how long it had been sitting down in the basement when we discovered it. Vitay says the potato bready thing is called KUGELIS….grated potato, bacon bits ( probably bacon grease too) baked in the oven then grilled served with sour cream. Yup, that sounds like Michigan Grandma’s revered potato pancakes. I think our old kitchen in Carroll County still has the grease splatters from when my dad and his siblings tried to recreate them twenty years ago. Good times. The one thing I remember from the trips to Michigan was the powdered sugar bow ties that came home from the bakery. Delish! KRUSCHIKI!!!!!!!!!!!!!!!! a little bit of heaven! Ate them in NYC until I got sick. I bet you were able to get great bowties in Chicago Emily. mmmmm – you know I love this post for so many reasons; all the memories tied to the recipes are the real jewel here. Perfect, Wendi, just perfect.